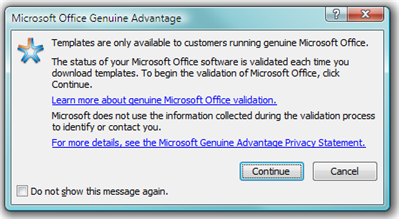 I saw a blog posting from my friend, Ed Bott on ZDNet this morning indicating that the Office Genuine Advantage program has been officially retired. While, according to the article, this took other MS related programs and personnel by surprise, this is a boon to Office users everywhere. You can now go online and download plug-ins, templates, and other related content for Office without having to verify your product code via Microsoft’s anti-piracy program. change doesn’t affect Office activation, which still requires a 25-character product key and direct contact with Microsoft’s activation servers. It also doesn’t affect Windows validation, which is apparently alive and well and is still required for some downloads, such as Microsoft Security Essentials.